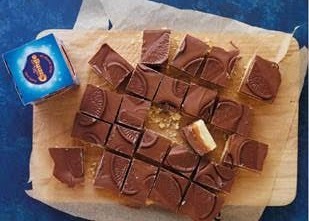 There are only couple of weeks to go and it'll be Father Day, and what better gift is there to give than the gift of Chocolate, more specifically A Cadbury Chocolate Orange, so why not make Father’s Day a little more special with this delicious Terry’s Chocolate Orange recipe: Millionaire shortbread, the perfect treat for the whole family, especially for dads, this Terry’s Chocolate Orange Millionaires Shortbread is an exciting twist on the traditional recipe with a crumbling shortbread base and indulgent caramel along with the signature chocolate orange flavour for its top layer. Preheat the oven to 180c/160fan and line a 20x20 brownie tin. In the bowl of a food processor, add the butter and plain flour. Blitz until the mixture resembles breadcrumbs and then add in the sugar and orange zest and blitz again to combine. Take the mixture out and work with your hands to form a ball of dough. Push the dough into the base of the lined tin until it is flat and even and bake for 25-30 minutes or until golden brown. Meanwhile, prepare the caramel. In a large non-stick frying pan, heat the condensed milk, golden syrup, butter, and sugar until the butter has melted and the mixture begins to boil. Stir constantly to keep it from burning. Turn the mixture down to a simmer and cook for 5-10 minutes or until the colour starts to become golden brown. Remove from the heat and transfer to a heatproof bowl to cool and thicken slightly.